India is the second largest country in terms of workforce generation in which the organized sector accounts for approximately 8–10% of the total workforce and 90–92% of the workforce is employed in the unorganized segment. There is a constant increase in the growth of informal sector workers among whom construction workers share the major portion, with a 11.27% increase in the growth rate between 2004–2005 and 2009–2010. As per the report of National Commission for Enterprises in Unorganized Sector (NCEUS), there are about 26–30 million workers in the construction industry. It is estimated that approximately 12–15 lakhs workers are employed in construction work in Karnataka alone. The construction workers are exposed to various occupational hazards at the workplace. These hazards can be in the form of physical, chemical, biological, and ergonomic hazards. In construction work, a broad range of tasks and activities, such as painting or carpentry, plastering, cutting kerbstones, stonemasonry, scabbling and surface grinding, tunneling, crushing and screening demolition material, clearing and removing rubble, chasing out mortar before repointing, laying epoxy floors, can create a considerable risk of exposure to multiple factors, thereby causing respiratory disease such as chronic obstructive pulmonary disease, occupational asthma, and silicosis. Further working with wet cement; epoxy resins; hardeners; acrylic sealants; bitumen or asphalt; solvents used in paints, glues, or other surface coatings; petrol; diesel; oils; greases; degreasers; descalers; and detergents can also increase the risk of occupational dermatitis.,,,, Dermatitis usually affects the hands and forearms of the workers; however, other body parts, such as face, neck or chest, and legs, can also be affected. Manipal, a small university town in Karnataka, is in the phase of rapid urban expansion and urbanization, leading to tremendous increase in construction work. Most of the construction workers are migrant employment driven workers from the less developed rural areas of various states employed in cities. These migrant workers are important for the reason that they are not available for long-term follow-up program. This on one hand devoid these workers from safety and welfare facilities and on the other hand puzzle the policymakers to estimate the burden of the health problem. Thus, the present study was undertaken to estimate the prevalence of respiratory and dermatological symptoms among the migrant construction workers. The present cross-sectional study was carried out in Udupi town, Karnataka. The Ethical Committee of Manipal University gave the ethical clearance for the study. A total of 340 migrant construction workers were included in the study based upon a calculated sample size of 340 taking 95% confidence interval, 15% relative precision, 36% prevalence and 10% non response. Informed consent was obtained from the participants. A pretested, standard questionnaire, modified according to the local setting, was used as a tool by the researcher to interview the workers. For respiratory symptoms assessment American Thoracic Society and the Division of Lung Diseases (ATS-DLD-78) questionnaire and for dermatological symptoms assessment Nordic Occupational Skin Questionnaire were used. This was followed by clinical examination for respiratory and dermatological morbidity. The pilot study was conducted to validate the questionnaire and estimate the prevalence. Statistical analysis was done by using Statistical Package for the Social Sciences (SPSS) version 15.0 (SPSS-Inc., Chicago, IL), which include calculation of percentages and proportions. Three hundred and forty workers participated in the present cross-sectional study. The mean age of the study participants is 26 ± 8.2 years with a range of 18–61 years. 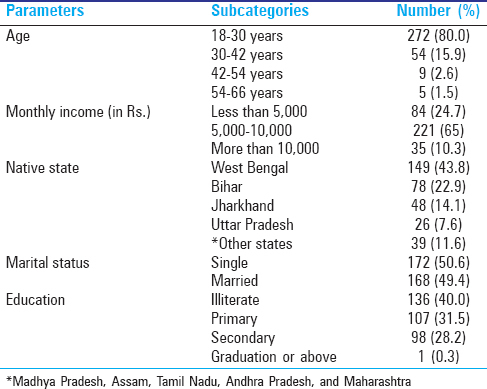 [Table 1] describes the sociodemographic profile of migratory construction workers. Of 340 workers, 272 (80%) workers belong to the age group of 18–30 years. It was found that 84 (24.7%) workers had a monthly income below Rs. 5,000 while only 13 (8.67%) workers had income more than Rs. 10,000. Most (43.8%) of the migratory workers are from West Bengal followed by those from Bihar and Jharkhand with 22.9% and 14.1%, respectively. Forty percent of the workers were illiterate, whereas only 28.2% workers had completed their secondary education. [Table 2] describes the occupational characteristics of the study subjects. It was found that 147 (43.2%) workers used to do farming at their native place before joining the construction work. Most of the workers 175 (51%) had 8 h of daily work, whereas 132 (38.8%) of workers were working for 12 h daily. The mean daily working hours was found to be 9.7 + 2 h. Workers were involved in various processes of construction such as plastering (17.1%), shuttering (28.3%), carpentering (9.7%), cement mixing (7.9%), bar bending (11.2%), helper (6.2%), and mason (3.2%). Majority of the workers (67.9%) were involved in construction work for less than 5 years, while 95 (27.9%) and 14 (4.1%) workers were in the occupation for 5–10 years and more than 10 years, respectively. Most of the workers (43.2%) were using only head protection (helmet), whereas 33.2% of the workers were not using any personal protective equipment (PPE). 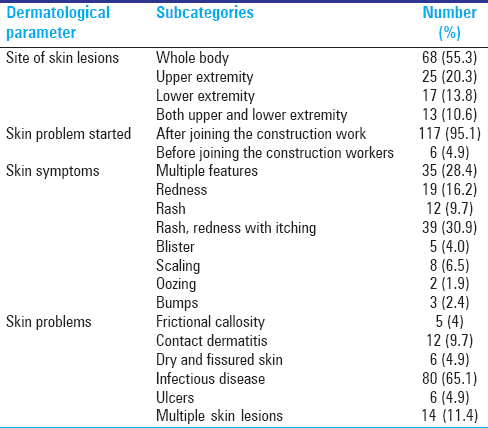 [Table 3] shows the respiratory and dermatological symptoms in migratory construction workers. One hundred and thirteen (33.2%) workers were suffering from one or more types of respiratory symptoms, of which 107 (94.6%) workers mentioned that respiratory problem started after joining the construction work. Forty-eight (14.1%) workers suffered from multiple respiratory symptoms while productive cough and dry cough were the two common symptoms present in 27 (7.9%) and 19 (5.9%) patients, respectively. 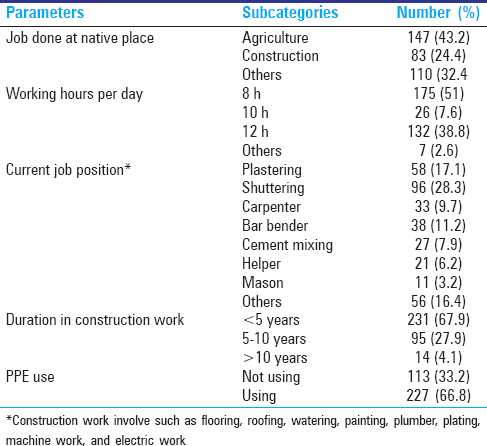 [Table 4] depicts that 123 (36.2%) workers were suffering from skin problems, of which 116 (94.3%) workers mentioned that skin problem started after joining the construction work. Most (28.4%) of the workers were suffering from multiple skin symptoms while rashes (9.7%), redness, (16.2%) and rash redness with itching (30.9%) were the most common dermatological symptoms. On dermatological clinical examination by dermatologists, 65% were having infectious skin diseases while 9.7% had contact dermatitis. On further evaluation, it was found that most of the workers had lesions on body parts such as neck, chest, abdomen, and pelvic region. The present cross-sectional study shows that 80% of the workers were in the age group of 18–30 years suggesting that mostly young population are involved in construction work. This study reported that there is high illiteracy rate among the construction workers and this could be one of the major causes of ignorance on health and low health-care service utilization; thus, the workers tend to neglect minor health ailments. This study found that 33.2% of the workers were not using any PPE's during work. A similar study in construction workers on occupational skin problem reported that only 45.7% workers were using PPE. In the present study, 67.9% of the workers have construction work experience in less than 5 years suggesting the migratory nature of their work due to high labor turnover. This is important because once exposed to the harmful factors at workplace, these workers are not available for further follow-up. The prevalence of respiratory symptoms was found to be 33.2%. Thus, at early age, these workers suffer from respiratory symptoms that may lead to compromise their health status. The workers are exposed to mixed dust at the work site as well off site because they live in the vicinity of the construction area where most of the migratory settlements are built. Of 113 workers with respiratory symptoms, the maximum suffered from productive cough (7.9%) and dry cough (5.9%), but most of the workers were reported to have multiple respiratory symptoms (14.1%). As per Mariammal et al. 's  study, among construction workers having work experience of more than 15 years respiratory morbidities, such as dyspnea (15%), sinusitis (40%), sneezing (30%), running nose (10%), and asthma (5%), are common. Thus, to conclude the migrant male workers suffered from multiple respiratory and dermatological symptoms. Most of these workers are young and lack basic education. There is no provision of preemployment and periodic medical examination for these workers and none of the workers had social security such as health insurance. Workers work in odd environmental conditions throughout the year and all seasons thus predisposing them to develop multiple respiratory and dermatological symptoms. On the top of that, they lack awareness regarding hazards associated with construction work. Thus, raising awareness among them regarding early signs and symptoms of diseases and proper engineering intervention can be useful for protecting the health of these migrant construction workers. Srivastava R. Changing employment condition of the Indian workforce and implications for decent work. GLJ 2012;3:63-90. Karnataka State Construction Workers Central Union. Available from: http://www.kscwcu.org. [Last accessed on 2015 Apr 14]. Ringen K, Seegal J, Englund A. Safety and health in the construction industry. Annu Rev Public Health 1995;16:165-88. Shah KR, Tiwari RR. Occupation skin problems in construction workers. Indian J Dermatol 2010;55:348-51. Winder C, Carmody M. The dermal toxicity of cement. Toxicol Ind Health 2002;18:321-31. Poppe H, Poppe LM, Bröcker EB, Trautmann A. Do-it-yourself cement work: The main cause of severe irritant contact dermatitis requiring hospitalization. Contact Dermatitis 2013;68:111-5. Mariammal T, Jaisheeba AA, Sornaraj R. Work related respiratory symptoms and pulmonary function tests observed among construction and sanitary workers of Thoothukudi. Int J PharmTech Res 2012;4:1266-73. Trivedi A, Patel Y, Pandit N, Bhavsar B. Prevalence of skin morbidity among construction site workers working at Vadodara. Healthline 2011;2:31-3. Kuruvila M, Dubey S, Gahalaut P. Pattern of skin diseases among migrant construction workers in Mangalore. Indian J Dermatol Venereol Leprol 2006;72:129-32. Noe R, Cohen LA, Lederman E, Gould LH, Alsdurf H, Vranken P, et al. Skin disorders among construction workers following Hurricane Katrina and Hurricane Rita: An outbreak investigation in New Orleans, Louisiana. Arch Dermatol 2007;143:1393-8.